Serve Robust Tomato Sauce over your favorite pasta; add toasted garlic bread and tossed salad. According to the food calendar, we are in the midst of National Pasta Month. In my book pasta is always good from mac ‘n cheese, to ravioli to spaghetti with meat sauce, you can’t go wrong with pasta. 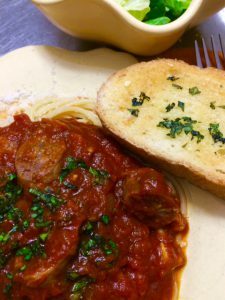 This robust red sauce is one to keep on hand– I usually make a double batch keeping some in the freezer as an on-hand dinner option. Sauté pork or turkey Italian sausage or ground beef; stir meat into the sauce and serve over your fav pasta. Prefer sans meat—it is just as good tossed with vegetables. How easy is that? Sauté onion and garlic in hot oil in a 3-qt. saucepan over medium heat 2 to 3 minutes or until tender. Stir in Italian Seasoning Mix and paprika; cook 1 minute. Stir in crushed tomatoes, tomato sauce, water and red wine; bring to a boil, stirring constantly. Reduce heat to low, and simmer 40 to 45 minutes or until slightly thickened. Stir in salt and honey. YIELD: Approximately 10 cups sauce. *Adjust to taste, if you like a more or less sweet tomato sauce. *Adjust to taste if you like more or less spicy.